Childrens books self publishing may be a way to get your childrens books out to the public. You need to ask yourself if you want to self publish childrens books? In other words, are you an author considering self publishing? Are you looking for advice on how to self publish childrens books? Are you considering starting your own childrens books self publishing company? There are many companies publishing childrens books; do you want be be one of those company’s publishing childrens books? I self published my first childrens book in 1993 and more recently, I published two online childrens books. I’ve established my own web site to self publish kids books, because I have a passion for creative expression. And SBI! is geared for passionate people like myself. Yes, I’m an author self publishing and I love it! Plus, I'm making money at it. I have so many more options to choose from and so many marketing possibilities. What, you don’t want to market? You want someone to take your book, pay you a royalty, then each month send you checks for all your books being sold? No, that’s not you else why would you be here checking our childrens books self publishing? You do know that you have to spend a lot of time marketimg your books. By building excellent content and following the guidelines, you get traffic and build trust with people and they eventually purchase your books. You can both self publish hard copies or ebooks as I’ve done. Let me share with you a little secret called the self publish secret. You can make an excellent income as a self publisher. Yes, I know, publishing childrens books won't make you a millionaire financially. But you'll know in your heart and you'll feel exceptionally wealthy when you get feedback, like I've received, that kids and moms love reading your kids book. Some of my more experienced writers/cohorts at SBI! are earning excellent incomes through their e-products. Read about heir successes by clicking to discover a whole new way of thinking about childrens books self piblishing. And you can even get your book on Amazon! You can create a hard copy of the ebook via Amazon's CreateSpace On Demand Self Publishing. 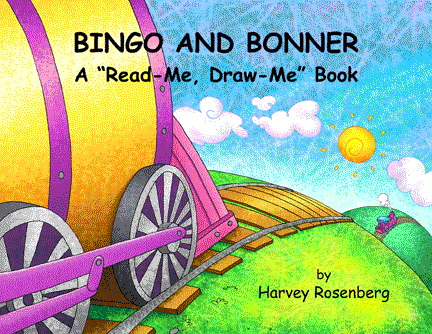 Bingo and Bonner, A Read-Me, Draw-Me Book, which is a story about the true meaning of friendship. I also decided to add a unit study, so homeschooling moms and WAHM could assist their kids in making and keeping friends. The unit study on friendship has 15 exercises, activities and games while covering the important topics of forgiveness, acceptance and love. Here are sample pages from Friendship Unit Study. I've shared the above to show what is possible through childrens books self publishing. The information on Childrens Books Self Publishing belongs to Childrens Educational Books.